Twelve miles west of Montego Bay, 2,200 acres of lush, quiet and pristine north-coast property is Tryall. Steeped in the history of eighteenth century plantation past, Tryall presents a world-acclaimed golf course, a spectacular arched expanse of beach, state-of-the-art tennis center and an abundance of facilities to suit all, including a beauty salon and wellness services, waiter services from the beach bar, gym, art gallery and internet facilities and, if you wish to dine away from the villa, superb dining can be found at the first rate Great House restaurant. Heron Cove, completely renovated in 2003, is dramatically situated on 2 acres on a point overlooking the sea, offering perfect sunset viewing. All rooms have water views. Easy swimming access to sea from steps. Spectacular 70 foot infinity edge pool. Three spacious bedrooms (2 Kings, 1 Queen) with Jamaican mahogany beds designed by the owners all open out to pool and sea views. 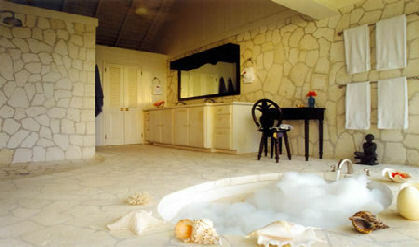 All have private baths made of native Jamaican limestone. Cable TV and computer access in bar room and library. There is a large living room and open-air verandah with the dining area near the sea. A spectacular setting!